Review: Waterfowl Festival in Easton, Md. I love outdoor festivals in the fall, and you know I love dogs, so I decided to trek out to Easton, Md., today to check out the annual Waterfowl Festival. The event encompasses much of historic downtown Easton, and is going on all weekend, Nov. 8-9-10. Tickets are $12, and can be purchased at booths onsite. 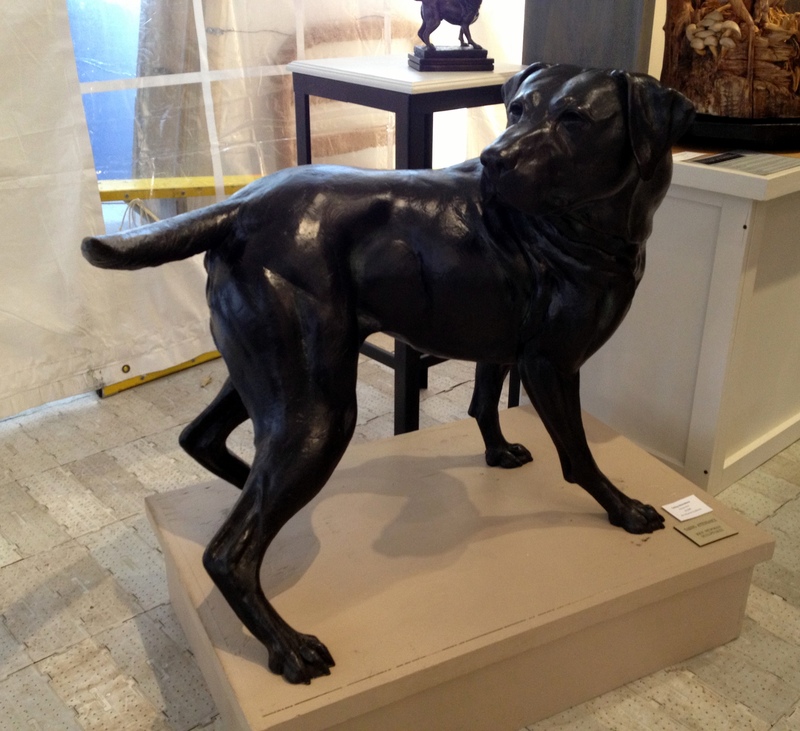 There are tons of art exhibits in tents and buildings downtown, featuring paintings, photography and sculptures, much of it depicting birds and sporting dogs. The downtown area has lots of cute shops, with art galleries, clothing and gift boutiques. 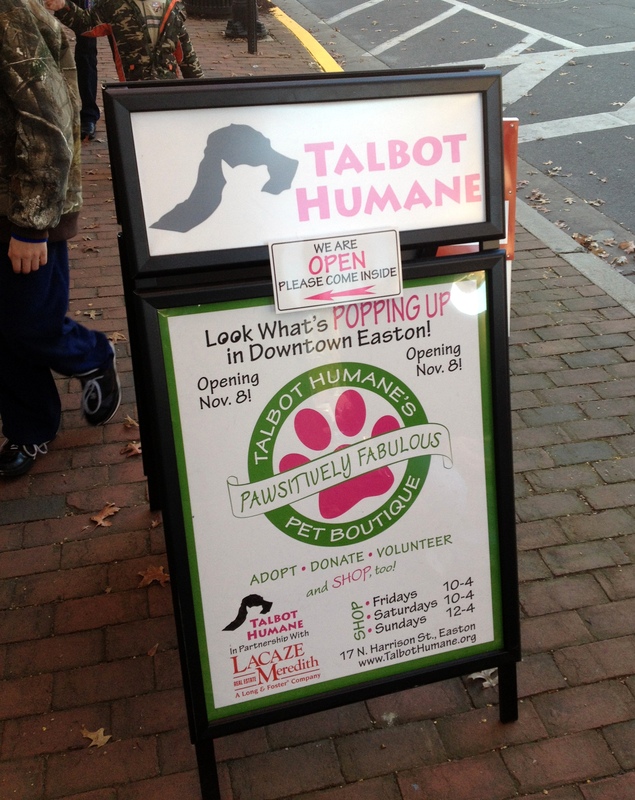 The local shelter–the Talbot Humane Society–has a new storefront with a good selection of gifts for animals and animal lovers. 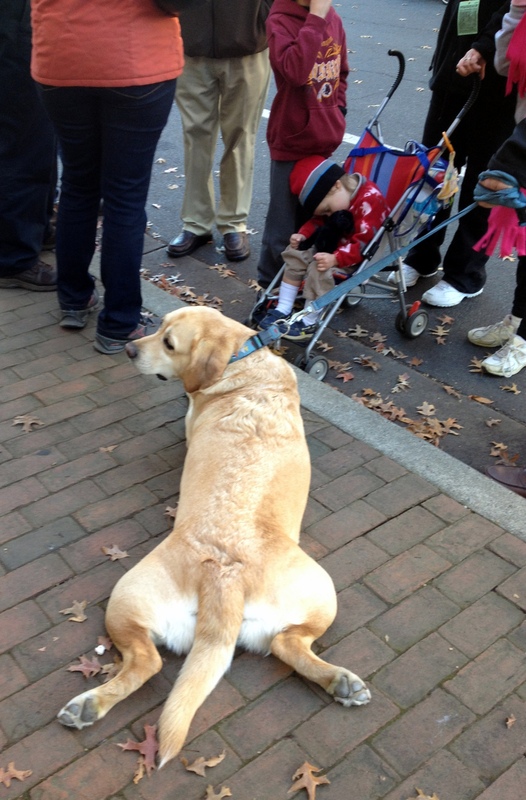 Many festival attendees brought their dogs, this guy had no problem making himself comfortable right on the sidewalk. 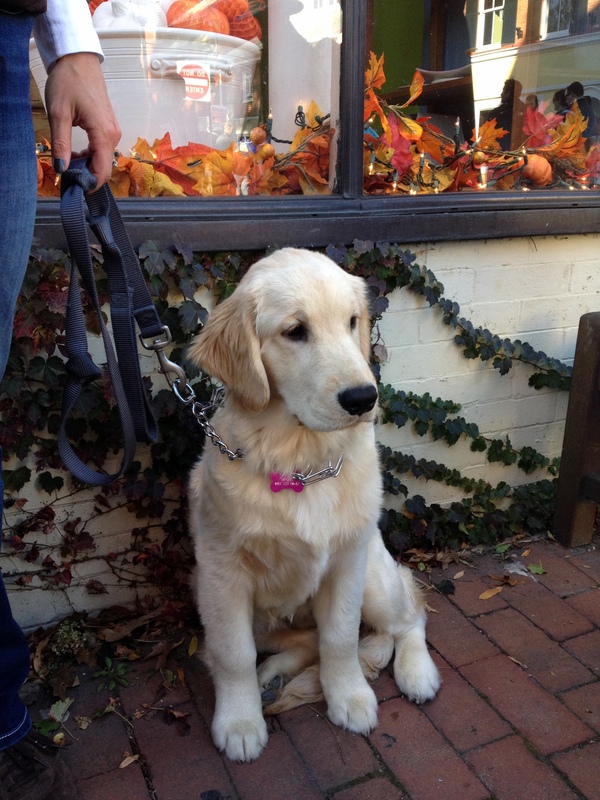 And this adorable Golden pup sat calmly observing the people strolling up the street. There are competitions and demonstrations of dock diving dogs, duck calling, fly fishing, retrievers and birds of prey. 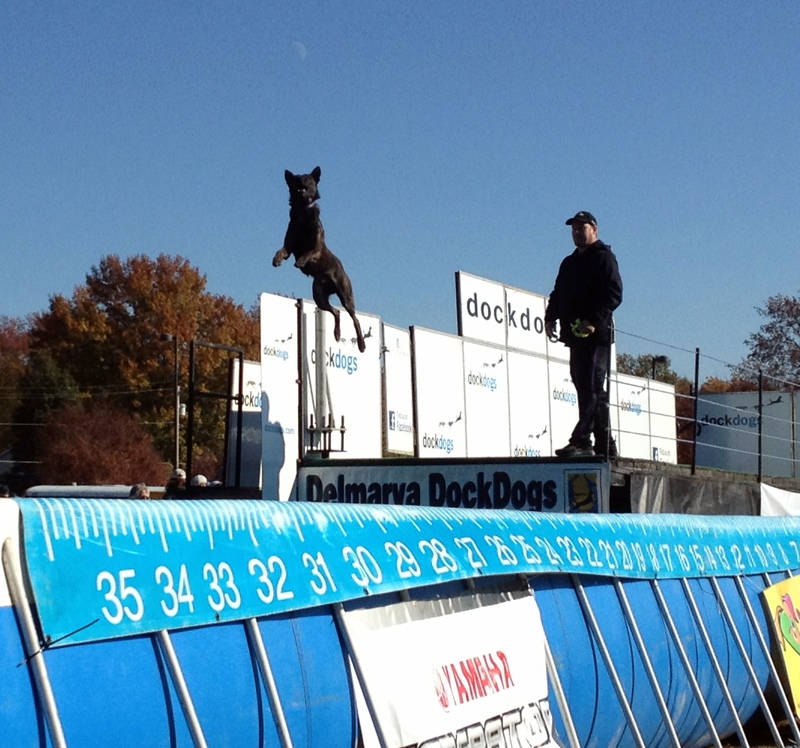 The announcer at the dock diving, which is being held at the Easton Middle School grounds, did a good job of explaining the different types of dock competitions and how each dog achieves certain levels based on the distance they can jump. There were more than a few pooches who wouldn’t jump in the pool at all, but this guy gets the award for greatest height. And this handler got a good laugh from the crowd because she screamed, “Go get the bad guy!” to get her dog to dive into the pool after the lure. Overall, the crowds weren’t bad, and there were more than enough activities to keep busy all day. There are shuttle buses that run continuously between the events outside of downtown, so I recommend parking, then walking or riding a bus to all events. My only complaint is the restaurants in town weren’t prepared, despite a huge banner touting their “Oysters and Brews” in the garden from 3-7, when we tried to eat at the Tidewater Inn at 3:30 the hostess told us the kitchen was overwhelmed and they weren’t seating anyone until 5 pm. Two other restaurants we tried also weren’t serving from 2 to 5, even though the blocked-off main street was full of hungry event attendees. Lines at the outdoor food vendors were of course long. But overall, if you want to enjoy the fall weather tomorrow, Easton is only about an hour and a half’s drive from downtown DC, making it a great day trip! 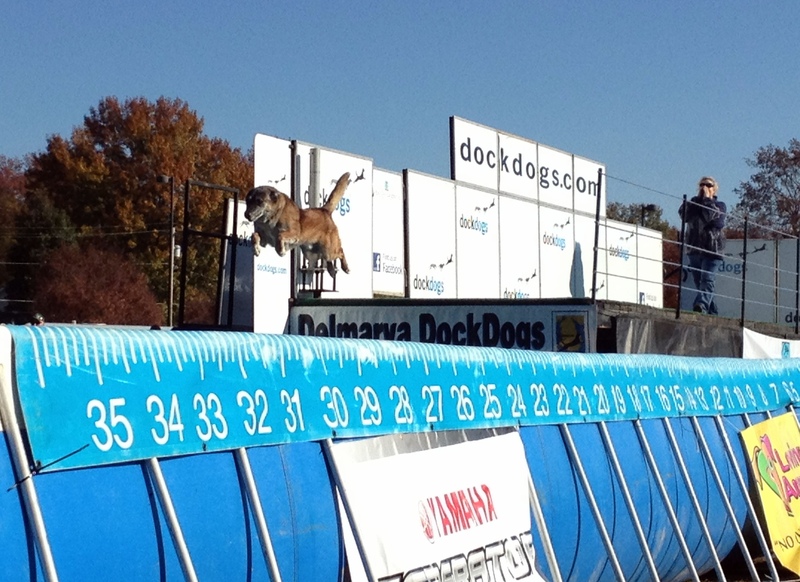 The announcer explained in one round the reason the handler yells “get the bad guy” is that dog is a retired K9 – he is 10 years old and loves every moment of the “apprehension” of the bumper! Yeehah! You should have seen him jump in the height competition – 5ft6inches – he soared like an eagle!